S.H. Figuarts Kamen Rider Zi-O kicks off this year’s new Figuarts sub-line as a pretty solid release. While assuredly many will take issue with this figure’s lack of accessories (which are included with the Ride Striker) this figure has a lot to offer and lots of personality. Zi-O is a well rounded, well articulated figure that fits in fantastically with mainline figuarts as well Shinkocchou Seihou releases. Though Seihou Kamen Rider Kiva still hasn’t been released, seeing Zi-O with his fellow lead riders is still quite the sight. And if you happen to have a DX Time Mazine as I do, you’ll find that Figuarts Zi-O works quite well with him. Zi-O also compliments Shinkocchou Seihou Kamen Rider Decade marvelously. We’ve attached the full 60+ image gallery to this post, but you can also check out the full review of Kamen Rider Zi-O by clicking “Discuss on the TokuNation Forums” at the bottom of this post. Next time, things heat up, with our gallery of Shinkocchou Seihou Kamen Rider W Heat/Metal! 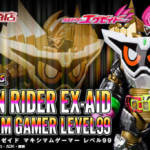 Premium Bandai Announces SH Figuarts Kamen Rider Ex-Aid Maximum Gamer LVL99! A new Kamen Rider Ex-Aid item has been announced for the SH Figuarts action figure series! 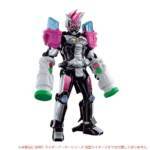 This is SH Figuarts Maximum Gamer LVL99- Kamen Rider Ex-Aid’s penultimate form- a powerful set of armor that also has the ability to purify the Bugster virus that plagues Ex-Aid’s opponents. The figure comes with its signature weapon- the Gashacon Key Slasher for added effects! Currently, Maximum Gamer LVL99 is scheduled for release in May 2019! The price is a steep 9936 Yen before shipping and handling. Toei has released the first full trailer for the upcoming Kamen Rider crossover film, Kamen Rider: Heisei Generations Forever! This epic crossover features a clash of all Heisei-Era Kamen Riders against a threat that could change reality as we know it. Heisei Generations Forever is currently scheduled for release on December 22 2018! New Kamen Rider Zi-O Rider Kick Figure RideArmor Images Released! A plethora of new images for the upcoming Kamen Rider Zi-O toyline have been released! This is our best look yet at the Rider Kick Figure series- specifically the Rider Armor releases. These figures represent the powers of legendary Kamen Riders! The next two releases in this series will be Rider Armors based on Kamen Rider Ex-Aid and Kamen Rider Ghost! Both Armors have reversible color patterns to better match the basic RKF bodies belonging to Kamen Rider Zi-O and Kamen Rider Geiz. And as an extra bonus we have a close look at the new Riders’ method of transportation- the DX RideStriker! This is a unique motorcycle toy that transforms into a special RideWatch that can be used in the DX ZikuDriver. With the premiere of Kamen Rider Zi-O only days away, merchandise is already on its way to store shelves! Be sure to stop by your preferred Rider retailer to stock up on all your Zi-O needs! 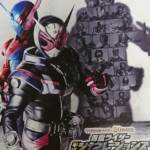 Kamen Rider Zi-O September Magazine Scans Posted Online- First Look At Ex-Aid & Drive RideArmors! We are merely days away from the premiere of the 20th and final Heisei Era Kamen Rider series, and now we have been given a few quick shots at the upcoming adventures of Kamen Rider Zi-O! 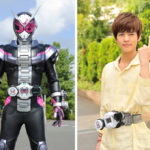 *Kamen Rider Zi-O & his counterpart Kamen Rider Geiz testing out their new henshin belts and weapons. Zi-O uses the Zikan Gilade sword while Geiz controls the Zikan Zax crossbow. Zi-O’s unique motorcycle, the RideStriker is also on display, rounding out his arsenal. *The monstrous AnotherRiders are shown in full! These are corrupted versions of past Kamen Riders awakened by the villainous TimeJackers. The AnotherRider versions of Kamen Rider Build and Kamen Rider Ex-Aid will be Zi-Os’ first proper opponents. *By defeating the AnotherRiders, Zi-O will gain the Riders’ powers. We get to see the effects of this thanks to Zi-O’s Armor Time– channeling new forms based on the past Rider in question. The form detailed in this months’ scan is the Kamen Rider Ex-Aid RideArmor! In this new configuration Zi-O gains powerful punching attacks thanks to new piston weapons. 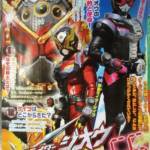 *Not to be outdone, Kamen Rider Geiz is shown obtaining the Kamen Rider Drive RideArmor! This new form grants Geiz powerful speed-kicks and control of Drive’s trademark ShiftCar. *Looming over the Riders’ adventures is the sinister Demon King ZI-O! This figure is a golden corrupted version of Kamen Rider Zi-O from the same future as Kamen Rider Geiz- a world without hope ruled by a merciless king. Is this Zi-O’s ultimate fate? Only time will tell! Kamen Rider Zi-O is officially scheduled to begin on September 2 2018! 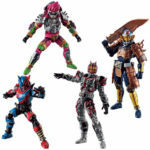 Stay tuned to TokuNation as we keep you up to date on this remarkable new Rider series! 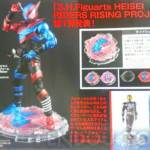 As you might recall, Tamashii Nations announced the S.H.Figuarts Heisei Riders Rising Project to coincide with the launch of Kamen Rider Zi-O and the end of the Heisei Era. Many are eager to see what will come of this announcement, and our first one comes in the form of the S.H.Figuarts 20 Kamen Rider Kicks reissues of older S.H.Figuarts Kamen Rider figures. What sets these Figuarts apart from their first releases is the fact that they’ll include special Tamashii Act stage stands: these stands include parts that will mimic one of Kamen Rider Zi-O’s Ride Watches in appearances and of course they’ll be themed after each corresponding Rider. Each of these Figuarts will cost 5400 yen a piece, going in order, our first batch of releases will include Kamen Riders Build, Faiz, Gaim, Ex-Aid Blade, Den-O, Drive, and Ryuki with Drive and Den-O coming out January 2019. This will be an excellent opportunity for those that may have missed out on these figures the first time around, or for those new to the fandom looking to dive head first into the fan favorite S.H.Figuarts line. Full Kamen Rider Zi-O Trailer, Cast & Story Details Released! Following this mornings’ press conference, we have now learned a great deal about the cast of the 20th Heisei Kamen Rider series- Kamen Rider Zi-O! *Kamen Rider Geiz is actually a reference to the characters human name, Geiz Myokoin. He was sent back in time to kill Sougo before the Demon King can awaken. *The female lead is also a time traveler; Tsukoyomi tries to guide Sougo & Geiz on the right path. *Sougo’s great-uncle Junichiro Tokiwa will run the “hangout” area this season- a boutique called the Kujigojido Shop. He is a watchmaker & knows a lot about past Kamen Riders. *To stop the Demon King from awakening & destroying the future, Zi-O & Geiz will travel through time to meet with past Kamen Riders. The cast of Kamen Rider Build and several faces from Kamen Rider Ex-Aid are shown returning to greet these new heroes! *The villains are known as the TimeJackers and they come from the future to replace Zi-O with their own King- via candidates known as Another Riders– people found in other times & granted powers similar to Kamen Riders with devices called AnotherWatches. These AnotherRiders appear as monstrous versions of past Kamen Riders. By defeating them, Zi-O & Geiz will gain the powers of past Riders. *Schwartz is the name of the TimeJackers’ leader- described as a violent older man. He is aided by a woman named Aura who can convince others to willingly accept AnotherRider powers. Accompanying them is a young man by the name of Wool who playfully experiments with time for his own amusement. *A mysterious figure known as Wars appears to both the Riders & the TimeJackers. This man is described as “a prophet from the future” and reads tales of heroic actions from his unique book. Kamen Rider Zi-O officially begins September 2 2018! Be sure to join in our Ongoing Zi-O Rumor Thread to share your thoughts and fears about this exciting new series! All times are GMT -4. The time now is 9:59 AM.